As the real estate market changes after years of aggressive growth, investors everywhere are faced with uncertainty, wanting to know how to prepare for a potential real estate bust and make sure they donâ€™t lose money. 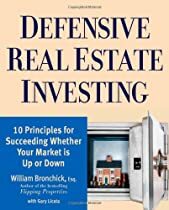 In his authoritative new work, Defensive Real Estate Investing, bestselling author and real estate expert William Bronchick provides guiding principles to safe investments for beginning to intermediate real estate investors. This book, based on Bronchickâ€™s successful lectures and articles, gives practical, sensible tips for anyone looking to limit risk and make sound investment choices, no matter what their local market conditions. This easy-to-follow, indispensable guide provides reassurance to investors that they can still make safe choices and achieve maximum, long-term wealth in real estate.